In New Hampshire, there was proposal floated recently that would have allowed New Hampshire State Troopers to have sleeve tattoos on both arms, one tattoo on each hand, and even face and neck tattoos if the boss signs off. It failed spectacularly- the House Criminal Justice and Public Safety Committee voted 20-0 to recommend that the full House kill the measure. While many police associations have had tremendous success getting the rules changed as far as cops displaying visible tattoos, usually those agreements were the result of some kind of compromise. For instance, many agencies that used to force officers to wear sleeves over visible tattoos on the arms have since changed the rules to allow officers to display their body art. 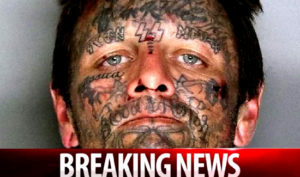 Facial tattoos are very popular with gang members of all types. Frequently the ink refers to murders committed or gang affiliation. 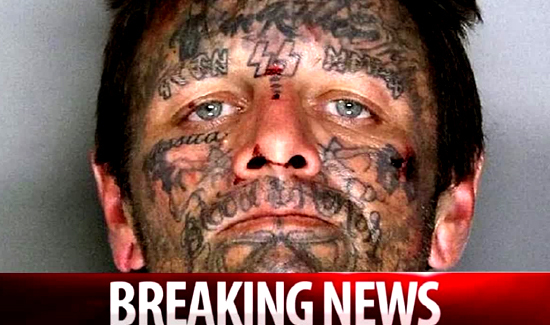 But it’s hard to imagine any lawmakers in their right mind signing off on a proposal that would allow face tattoos for state troopers. Call me old fashioned or whatever, but I’d be VERY uncomfortable with any heavily tattooed person approaching me, in a police uniform or not. I’m not a fan of tattooing at all, to start, but most of the more heavily tattooed persons I’ve encountered in my lifetime have been less than savory persons. That perception hasn’t changed because it’s become popular now with so many. I’m not particularly comfortable with multiple piercings in many places, either, largely for the same reason. 1 or 2 per ear are 1 thing; but lips, noses. tongues, etc not only aren’t attractive, and often appear unsanitary, they also tend to attach to less than savory characters. What makes you so special to judge people and to be VERY uncomfortable with people that have tattoos? I am in the military and served over 11 years in some of the worst places on Earth. I have many tattoos and they all have meaning from different points in my life. So what you are saying is a big problem with the perception that people have with tattoos. As long as I don’t have any offensive material then I have the right to display what I want, even if it hurts your feelings. You are allowed to have your opinion because it is your right but the continued perception that people with tattoos are unsavory individuals is a very ignorant statement.